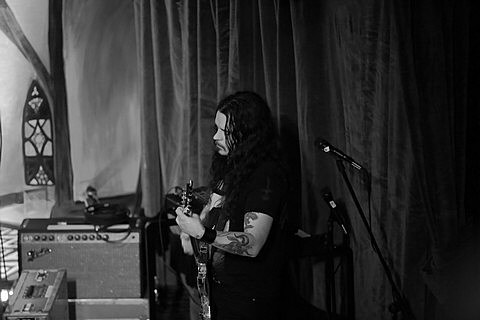 Improvisational trio Nazoranai, which consists of off-kilter noise heavyweights Stephen O’Malley (SunnO))) // Khanate), highly influential Japanese musician Keiji Haino, and Australian multi-instrumentalist Oren Ambarchi, will be embarking on a brief North American tour in May. That tour includes a performance at the Empty Bottle on May 20, and the show just so happens to be a part of the Red Bull Sound Select series. The trio will receive excellent support from local thrash outfit Oozing Wound and psych-folk auteur Ryley Walker, and you can RSVP for $3 “tickets” now. You have to show up before 10PM to get the deal, otherwise it’s $10 thereafter (which is also worth it for this lineup). As discussed, Oozing Wound will also be playing at Do Division 2014 with High on Fire, J Mascis, Screaming Females, and others. Their live show is every bit as crushing and caustic as their great 2013 full-length Retrash, so do yourself a favor and catch ’em live as soon as you can.